Do you collect great quotes that you hear? Or do you wish you had remembered who said that and exactly what they said? Please post your quotes here and any questions – searching for quotes that you sort of half remember. Let’s try to stay to quotes related to risk management please, but we will look the other way for particularly good entries that are slightly off topic. This page has received over 25,000 views since installation but only a handful of visitor contributions. 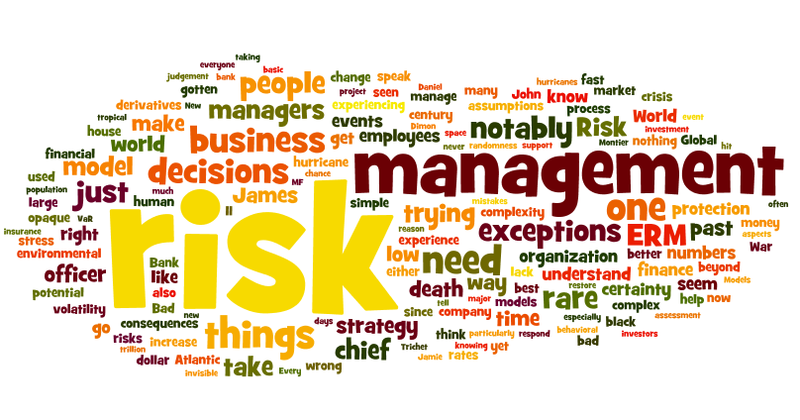 You are encouraged to add the best risk management quotes that you have seen. And if you cannot add any quotes, at least give us your opinion. Just a click to indicate which quotes that you find to be the best. If you were to take into account everything…you would never do anything. It is better to have a brave heart and endure one half of the terrors we dread than to [calculate] all of the terrors and suffer nothing at all …Big things are won by big dangers. Xerxes reportedly said this when his plans for the invasion of Greece were challenged. By the way, that invasion failed – due to poor planning – failure to anticipate things like WINTER and MOUNTAIN LIONS. Once understanding risk, somebody will mitigate it. It turns out that while strategists’ forecasts are remarkably close to the mark much of the time, they are woefully unreliable during inflection points. For example, strategists overestimated the S&P 500’s year-end price by 26.2 percent on average during the dot-com bust from 2000 to 2002. Then they underestimated the index’s year-end price by 10.6 percent during the early recovery in the first half of 2003. It happened again during the financial crisis. Strategists overestimated the S&P 500’s year-end price by 64.3 percent in 2008 and then underestimated it by 10.9 percent during the first half of 2009. In other words, the forecasts were least useful when they mattered most. Unwarranted disappointment is is the hallmark of excessive optimism and unwarranted surprise if the hallmark of overconfidence. Using the same co-variance matrix to measure risk and to optimize positions inevitably leads to biases in the measurement of risk. Only extremists believe that the market view of price is the exact right value of a security. Only madmen believe that the market view of risk is an accurate portrayal. Mathematical models that profess to analyze the market view of risk usually assume that the instrument that they are analyzing is tradeable right up to the instant of oblivion. Rarely is that the case. But exactly when the position is going to be untradable is unknowable. And that is just one of the real world risks that are not included in the models. I can’t remember, however, an instance when reading a 10-K’s “risk” section has helped me in evaluating a business. That’s not because the identified risks aren’t real. The truly important risks, however, are usually well known. Beyond that, a 10-K’s catalog of risks is seldom of aid in assessing: (1) the probability of the threatening event actually occurring; (2) the range of costs if it does occur; and (3) the timing of the possible loss. A threat that will only surface 50 years from now may be a problem for society, but it is not a financial problem for today’s investor. The other thing about those 10k risk disclosures that makes them extra useless is that management usually doesn’t disclose whether they are doing anything about the risks that they describe. ice cream sales and forest fires are correlated because both occur more often in the summer heat. But there is no causation; you don’t light a patch of the Montana brush on fire when you buy a pint of Häagen-Dazs. Studies from Katrina and other storms have found that having survived a hurricane makes one less likely to evacuate the next time one comes. risk transfer was illusory. When large banks and thrifts sold loans into securitization pools, the contracts typically included “reps and warranties,” which obliged them to buy back a defaulting loan if it did not meet the lending standards specified in the contract. The likelihood that investors and speculators would heed the warnings of a government official when asset prices are increasing at annual rates of 20 to 30 percent a year is not especially high. In the strict formulation of the causal law-if we know the present, we can calculate the future-it is not the conclusion that is wrong, but the premise. Complexity is a defining characteristic of society and many of its technologies today. Yet simplicity and linearity remain the defining characteristics of the theories we use to explain bad events that emerge from this complexity. Each manager is loss averse regarding any outcomes that will be attributed to him. In an organizational setting, the natural feeling of loss aversion can be exacerbated by the system of rewards and punishment. In many companies, creating a large gain will lead to modest rewards, while creating an equal-sized loss will get you fired. Under those terms, even a manager who starts out risk neutral, willing to take any bet that will make money on average, will become highly risk averse. Rather than solving a problem, the organizational structure is making things worse. Compensation for traders is often very different. If they make a large gain, they get a very large bonus. If they make a large loss, they move on to be a trader for a different firm. The most successful traders in banks move out to create their own hedge funds where they keep 20% of gains and close the fund if there are losses. Result is that traders are highly risk seeking. Carelessness and overconfidence are usually more dangerous than deliberately accepted risks. This is being said in the wake of reported terminations of 30 trainees for cheating on a training exam. Gambling is placing capital at risk in a zero sum game with an uncertain outcome in a system in which the odds are generally unfavorable over long periods of time. Investing, on the other hand, is placing capital at risk in a positive sum game with an uncertain outcome in a system in which the odds are generally favorable over long periods of time. So investing is better because positive sum over time means that investors have a positive expected value while gamblers have a negative expected value??? their norm is stability rather than turbulence. I’ve always wanted to ask someone who says that they do not believe in risk management if they would sell their seat belts to me for $50. …the vision of the mind that has captured the imagination of philosophers, cognitive scientists, economists, and political scientists since the 18th century – a dispassionate mind that makes decisions by weighing the evidence and reasoning to the most valid conclusions – bears no relation to how the mind and brain actually work. Risk models only have value if they are used effectively in combination with a limit management and control process. “I still remember the teasing we financial economists, Harry Markowitz, William Sharpe, and I, had to put up with from the physicists and chemists in Stockholm when we conceded that the basic unit of our research, the expected rate of return, was not actually observable. I tried to tease back by reminding them of their neutrino –a particle with no mass whose presence was inferred only as a missing residual from the interactions of other particles. But that was eight years ago. In the meantime, the neutrino has been detected”. Any time you make any kind of causal statement about economics, you are at least implicitly using a model of how the economy works. And when you refuse to be explicit about that model, you almost always end up – whether you know it or not – de facto using models that are much more simplistic than the crossing curves or whatever your intellectual opponents are using. Also Paul Krugman from the same blog post. The business of finance seems to have devolved into a world of rent-seeking and zero-sum games. there is no universally accepted formula for assessing diversification. In fact, the whole topic of diversification is typically clouded with hand waving and qualitative judgments. THe fact is that one side thinks the profits to be won outweigh the risks to be incurred, and the other side would rather avoid danger than accept an immediate loss. That it reached conclusions quite different from what the ordinary uninstructed person would expect added, I suppose, to its intellectual prestige. That its teaching, translated into practice, was austere and often unpalatable, lent it virtue. That it was adapted to carry a vast and logical superstructure, gave it beauty. That it could explain much social injustice and apparent cruelty as an inevitable incident in the scheme of progress,and the attempt to change such things as likely on the whole to do more harm than good, commended it to authority.That it afforded a measure of justification to the free activities of the individual capitalist, attracted to it the support of the dominant social force behind authority. all organizations have a risk attitude that ranges from extreme risk aversion to a radically risk seeking culture. Most often the actual risk attitude plays itself out in risk taking behaviors that underlie the basis for a risk appetite framework and strategy. Within the context of a risk culture which is defined primarily by the risk taking behaviors of its employees, every person has a risk attitude and appetite for risk. As part of its ethics activities, Enron created a Code of Ethics manual. Clearly, someone at Enron thought this was a great idea. And it was. Except that all 64 pages of the manual were disregarded on countless occasions. Complexity is the enemy of transparency and complexity is not a good thing in finance. To our knowledge, no macro stress test carried out ahead of the crisis identified the build-up of vulnerabilities. The message was overwhelmingly: “The system is sound”. Rather than being part of the solution, stress tests turned out to be part of the problem. They lulled policymakers and market participants into a false sense of security. There is a serious risk that, unless their limitations are fully understood, they will continue to do so in the future. We are just looking in the wrong places, expecting the future to resemble the past. The corporate governance of large banks was characterized by the creation of Potemkin villages to give the appearance of effective control and oversight. Computer models alone can no longer calculate meaningful probabilities about what will happen next in the eurozone. Instead, what really matters now in places ranging from Finland to Greece are non-quantitative issues such as political values, social cohesion and civic identity. Above all, the question of “credit” is key to working out whether bonds can ever be repaid. But this is not credit in the mathematical sense by which banks have often defined it (as a projected probability on a chart), but in the old fashioned, Latin – social – meaning (belief). The crucial variable, in other words, is whether voters have faith in their governments and central banks. Do they trust the safety of their banks? Are citizens willing to trust each other, and co-operate, when pain is imposed? Models themselves can provide tremendous insight, but they also can be, if not necessarily misused, certainly misunderstood. People can lose track of the fact that just because your model says you don’t have any risk, and you are running a very large balance sheet with a tremendous amount of leverage, it doesn’t necessarily mean that you should feel comforted. Internal models really need to be augmented by strong risk management capabilities, by individuals with experience who won’t just take models for granted, but actually take a look and see very large numbers and regardless of what the market is doing just ask the question: Does it make sense? For a central risk function, whether that is in a group centre or in a local company, one of the very important points is to strike a balance between the control aspect to your work and the support aspect to the business. There’s no lone genius who figures it all out and sends down the magic formula. Most people (corporation -(s) ) never think of sustainable risk management pragmatically unless they start losing money…some exploit loopholes and damn the consequences, some prefer to pay huge fines when caught because they know the limit (remit) of the law… some even consult with their lawyers before exploiting unethical loopholes… whois to be blamed…? What is your take on this…? Are you entangle in one of these fallacy web of narcissism? Perhaps it is a fundamental flaw in the ownership/governance model of the modern joint stock company. The owners have no real interest in the long term health of a firm – just an interest in what they can get out of holding a stock for a short period. The problems may be containable with some tweaks to regulations, but will not be solved until we stop our economy from being run by these extreme short term interests. Investors were never ‘rational’ as defined by standard finance. They were ‘normal’ in 1945, and they remain normal today. There is a continuum between certainty and uncertainty, just as there is between factors inside and outside of our control. By studying the uncertain, we may be able to break it down into elements of greater and lesser risk, of greater and lesser predictability. In the same way, between absolute control and absence of control lies the middle ground of influence and persuasion. Thus we may say that there is an expanding funnel of doubt. The contours of the funnel vary with each one of us, for the concept is personal. Nevertheless, they must inevitably have much in common, since they all start from a common point now. If we could give numerical values to our uncertainties we could construct a probability dispersion table. For example, we might say that the probability that in 1960 the rate of interest will lie between 31/2% and 4¼% is .15, We cannot, of course, do this in practice. Yet the expanding funnel of doubt is in the background of our thoughts not only in regard to interest but also in regard to the other factors: mortality, expenses, taxation. Banking history is littered with examples of manipulative conduct driven by misaligned incentives, of bank failures born of reckless, hubristic expansion and of unsustainable asset price bubbles cheered on by a consensus of self-interest or self delusion. An important lesson of history is that bankers, regulators and politicians alike repeatedly fail to learn the lessons of history: this time, they say, it is different. There is no such thing as IDIOT PROOF. It is not a crime to be a lousy manager, a failed risk taker or to lose simply boat loads of money. Many of our most prominent CEOs have done the same. Even apart from the instability due to speculation, there is the instability due to the characteristic of human nature that a large proportion of our positive activities depend on spontaneous optimism rather than on a mathematical expectation, whether moral or hedonistic or economic. Most, probably, of our decisions to do something positive, the full consequences of which will be drawn out over many days to come, can only be taken as a result of animal spirits — of a spontaneous urge to action rather than inaction, and not as the outcome of a weighted average of quantitative benefits multiplied by quantitative probabilities. I am as certain as certain can be— that a financial community with a more even balance between men and women, young and old, could not possibly do any worse than the system we have now. Of the many elemental flaws in macroeconomic practice is the true observation that the economic variables in which we might be most interested happen to be those which lend themselves least to measurement. Thus, the statistics which we take for granted and band around freely with each other measuring such ostensibly simple concepts as inflation, wealth, capital and debt, in fact involve all sorts of hidden assumptions, short-cuts and qualifications. So many, indeed, as to render reliance on them without respect for their limitations a very dangerous thing to do. While its original approval document indicated that the SCP was created with a hedging function in mind, the bank was unable to provide documentation over the next five years detailing the SCP’s hedging objectives and strategies; the assets, portfolio, risks, or tail events it was supposed to hedge; or how the size, nature, and effectiveness of its hedges were determined. The fact was that I was not a master of my actions, because I was not so insane as to attempt to bend events to conform to my policies. On the contrary, I bent my policies to accord with the unforeseen shape of events. Note to self: check to see when I am being “so insane as to attempt to bend events to conform with my policies”. There was a lot of hand-wringing last year among CEOs who cried “uncertainty” when faced with capital allocation decisions (despite many of their businesses having enjoyed record levels of both earnings and cash). The problem of the use of statistical tools and theorems comes from the people that try to domesticate the randomness within certain events and variables by the use of certain assumptions that would be difficult to satisfy. Thus, the results obtained while using a model without data that satisfies the assumptions are, naturally, wrong. Furthermore, the design of this models does not grant protection against randomness or the consequences of a black swan event. Imagining the death of the company is at the heart of ERM. This creates a huge barrier to risk management, especially when chief executives are founders. The separation between themselves and their company is often weak. So these execs will not be able to imagine the death of their company. My concern with risk management is that many (not all) risk professionals are trying to redefine risk management to make it something broader than it actually is. It is clear that for the large majority of individual investors, taking a shower and doing nothing would have been a better policy than implementing the ideas that came to mind. Facts that challenge such basic assumptions—and thereby threaten people’s livelihood and self-esteem—are simply not absorbed. With notably rare exceptions, Newt Gingrich is a loyal and faithful husband. With notably rare exceptions, Japanese nuclear reactors have been secure from earthquakes. Though unredeemably(sic) opaque, Mr. Madoff’s operations delivered excellent returns, with notably rare exceptions. With notably rare exceptions, the levees protecting New Orleans have held fast in the face of major hurricanes. With notably rare exceptions, locking all exits to the workplace is a harmless way to improve your employees’ productivity. With notably rare exceptions, petroleum extraction has minimal environmental impact. In summary, neither our model projections for the 21st century nor our analyses of trends in Atlantic hurricane and tropical storm counts over the past 120+ yr support the notion that greenhouse gas-induced warming leads to large increases in either tropical storm or overall hurricane numbers in the Atlantic. A new modeling study projects a large (~100%) increase in Atlantic category 4-5 hurricanes over the 21st century, but we estimate that this increase may not be detectable until the latter half of the century.